The genesis of Goen South was as a “mom-and-pop” company. 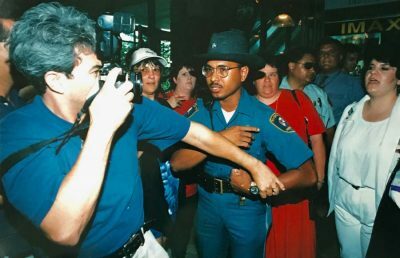 In 1992, Morris was working as a newspaper photojournalist and I was a microbiologist for the state. We knew that, eventually, we wanted children and we saw that neither of our positions would guarantee us financial success. If we were going to be able to support future kids, we needed to opt for a path in life in which to provide for our family. We both loved what we did, but we wanted our children to experience even more freedom than our parents had been able to provide for us. I spent weekends and nights back in the classroom to get my MBA while Morris started freelancing photography. Morris has always had an artist's heart and he loved to travel the back roads of Texas documenting disappearing Texas history. He held an art exhibit at the restaurant of some friends. A young engaged couple, Anthony and Sandi, were impressed by the exhibit and saw that Morris could produce something totally extraordinary for their wedding photos. We met with them and made it very clear we did not know the nuances of wedding photography. They said, “Just shoot it like your art.” The results were unique, the bride and groom were delighted, and there began to be many more calls for Morris's artistic talents. We soon realized San Antonio was suffering from a lack of an event management company that offered all wedding services under one roof, so along with photography, we added videography, wedding planning and floral services. As we went along, we recognized a similar need for linens and lighting and it was not long before we were coordinating and producing weddings at some of the most beautiful resorts and hotels in town. The hotel sales staff were impressed with our designs and began asking us to provide services for their corporate clients. That was the beginning of our company history, and the rest, as they say, is history. It was also the beginning of our young family. Our daughter, Grace was born in 1998. Our son, Otha Morris Goen, III (“Trip”) was born in 2000, just one week before his grandfather passed away. As soon as my doctor cleared me to travel, we headed to Houston. Otha was able to hold his grandson and namesake. The morning after we arrived, Otha passed away in his own bed surrounded by those who loved him including his brand-new grandson. The emotional roller coaster of new life and life passing was very hard on Morris, but he knows his dad would be proud. As time passed we settled into a good life. As the kids grew so did the business. Goen South was booming when suddenly, we were feeling the effects of the Great Recession. As the economy continued to spiral down, and with a young family to support, Morris and I had some tough decisions to make. After a lot of sleepless nights and a few tears, we resolved to survive as a company. We had faith that sooner or later the country would make an economic comeback, and we were determined to hold on until it did. We quit taking salaries so we could make payroll for our employees and went through our kids' college savings and then our retirements to pay our vendors and help keep the company afloat. We believed in our company and were determined to make it. We went through some hard and scary times; then slowly but surely, the economy began to turn around. In time, business in our industry was booming again, and our company was again growing at a rate that amazed us. We knew then that our tenacity had paid off and the sacrifices we had made were going to be worth it.